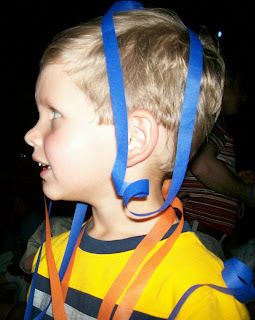 The one show at Disney that Dawson found very entertaining was Playhouse Disney Live On Stage. We saw it twice and I think he would have liked to have seen it even more. 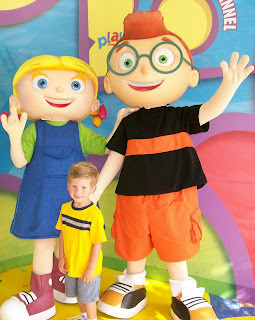 All of his favorite Saturday morning cartoon characters were in the show and the kids were encouraged to jump and dance around and they even had bubbles!! Mickey, Donald, and Goofy preparing for a surprise birthday party of Minnie. 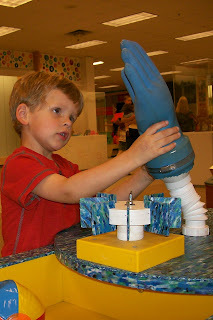 Handy Manny and his tools tyring to fix a bubble machine. 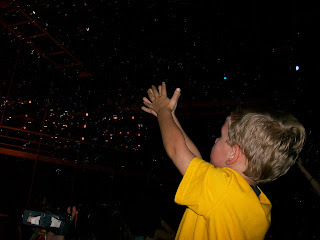 Dawson reaching up to pop the bubbles that were blown after the bubble machine was repaired. 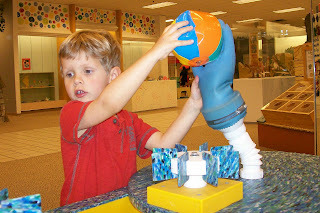 The Little Einsteins and Rocket. Winnie the Pooh, Darby, and Tigger trying to solve a mystery. Dawson covered in streamers at the end of the show. The landscaping throughout Disney is gorgeous. 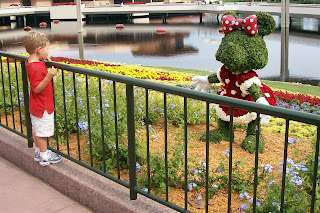 At Epcot, Dawson enjoyed an up-close view of some pretty neat flower arrangements. 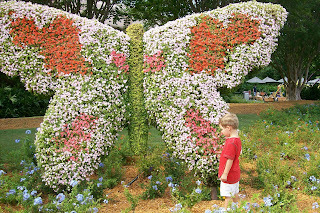 Checking out the butterfly make of flowers. Admiring the beautiful Minnie Mouse. 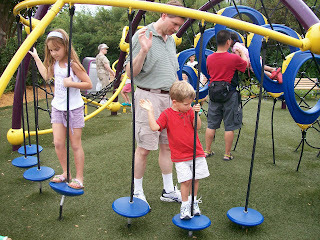 At Disney's Epcot there was a really neat obstacle-type playground for kids. 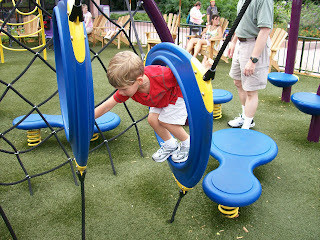 Dawson really enjoyed the challenge of climbing the ropes and making his way through the hoops. 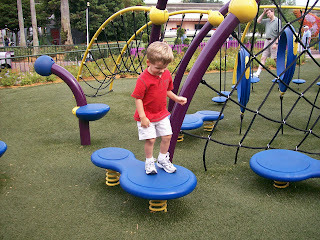 Jumping on the springy boards. Making his way across the stepping stones. 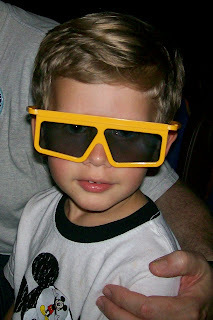 Dawson saw his first 3-D movie at Disney. 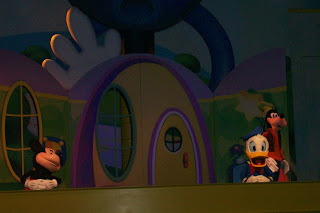 This picture was taken before Mickey's Philharmagic show, which featured Donald Duck trying to catch Mickey's magic conductor's wand. 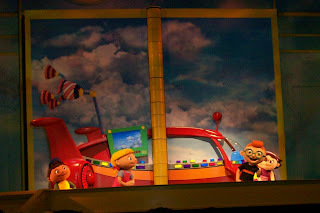 We also saw a more interactive 3-D movie, It's Tough to Be a Bug. 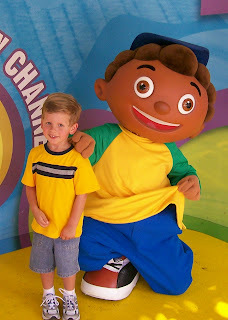 Dawson seemed to like both of them, but still preferred the rides to the shows. 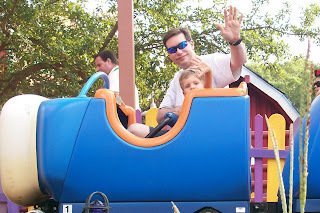 Here are a few pictures of Randy and Dawson on some of the kiddie rides at Disney. 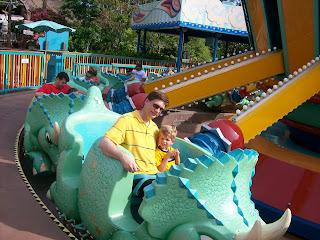 Randy and Dawson on Goofy's roller coaster. 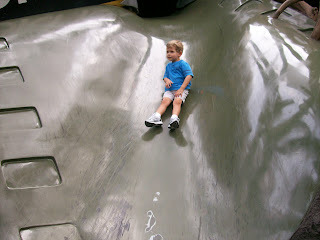 While Dawson did enjoy this roller coaster, he preferred Big Thunder Mountain, the adult train roller coaster. 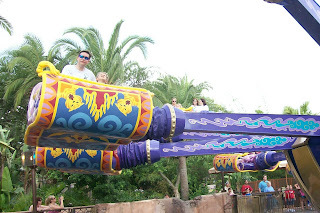 The Magic Carpets of Aladdin. Dawson is looking up at a camel that periodically "spits" on those passing by on the magic carpets. 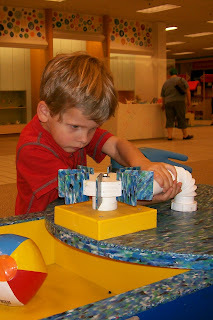 Getting ready for the Triceratops Spin. 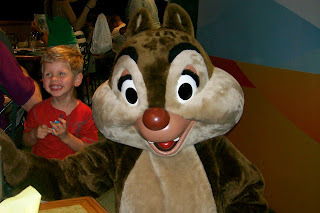 Splash Mountain was Dawson's favorite ride at Disney World. He and Randy rode it at least 6 times. Unfortunately, I had to wait on the sidelines because it wasn't considered safe for pregnant women. Randy said it was great to ride with Dawson because he smiled, laughed, and squealed throughout the ride. He especially liked going down the giant waterfall and getting soaked. 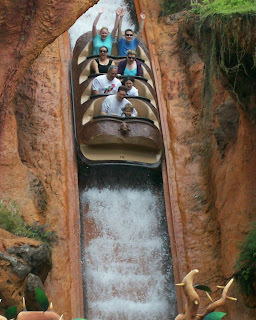 Below is a picture of them going down the waterfall - they are in the front seat. 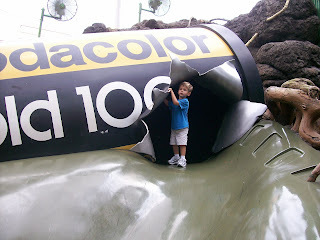 At Hollywood Studios, Dawson loved playing at the Honey, I Shrunk The Kids Playground. Everything was huge!! It was so much fun! 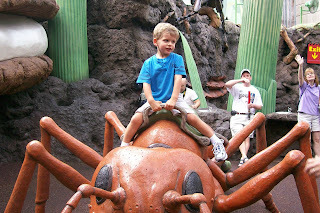 Sitting on the giant ant. Inside a roll of film. 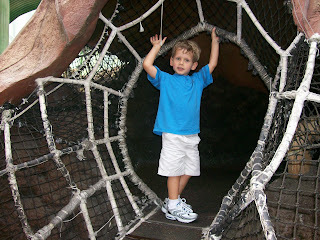 He loved this giant rope obstacle course - it was supposed to be a big spider web. 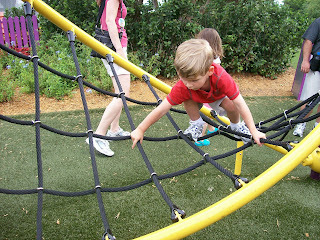 Playing on the spider web. 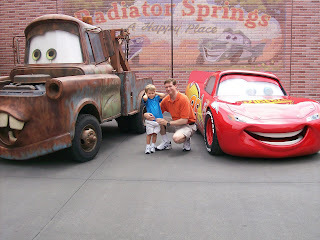 Dawson was very excited to see Lightning McQueen and Mator from the Cars movie. You'll notice he's covering his ears in the picture - that's because the vehicles were running and they were very loud. 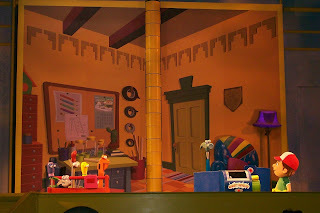 Our favorite character dining experience was at Hollywood and Vine where we were joined by the Playhouse Disney characters Leo, June, JoJo, and Goliath. 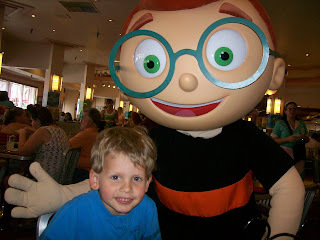 Dawson with Leo from Little Einsteins. Getting a hug from June. Dawson and the other kids joined June for some dancing fun during our meal. More dancing with June and JoJo. Giving Leo a big hug. Smiling as Quincy points out that they are both wearing yellow shirts. 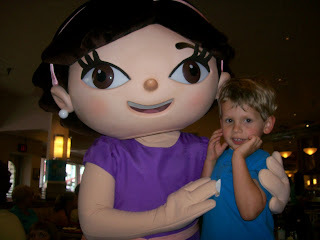 Also at the Hollywood and Vine character dining were JoJo and Goliath. 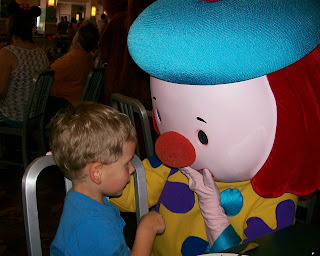 Talking to JoJo the clown. Giving Goliath a great big hug. 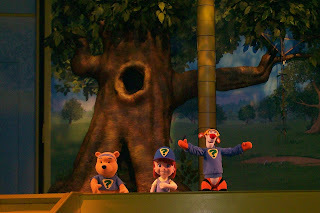 At the Crystal Palace we dined with the Tigger, Pooh, and friends. 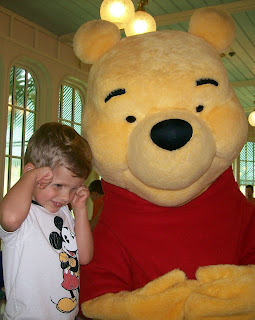 Dawson and Winnie the Pooh. 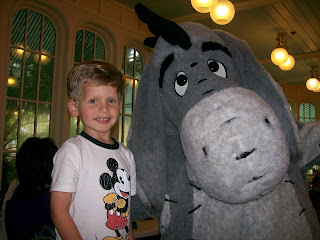 Looking very cute with Eeyore. 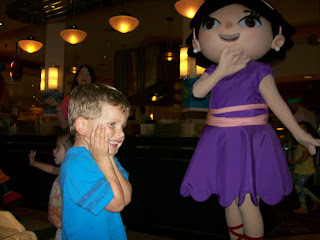 Dawson and the Mickey Friends at a character dining event at the Garden Grill. 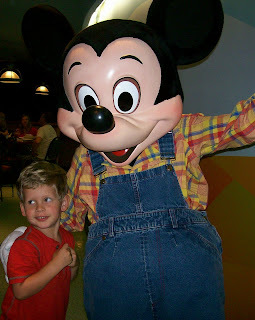 Dawson and a country-style Mickey. We're back from our amazing vacation in Disney World!!! Dawson had a wonderful time. 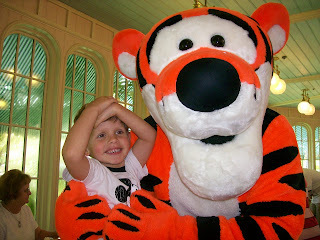 He enjoyed visiting the Disney parks, seeing the Disney characters, and experiencing all the rides. 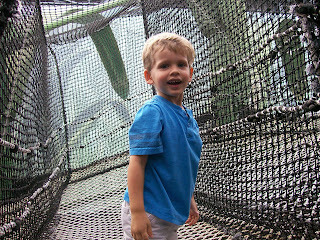 He was tall enough to ride almost every ride and he especially liked the big thrill rides. 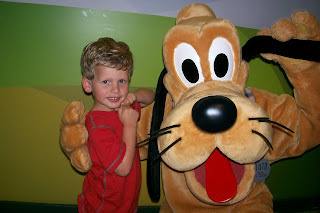 His favorite rides were Splash Mountain, Big Thunder Mountain, It's a Small World, Test Track, and Soarin. 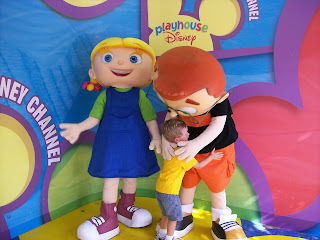 He also really enjoyed the Playhouse Disney Live On Stage show which featured many of the characters he watches on Playhouse Disney. Another favorite activity while we were there was character dining. 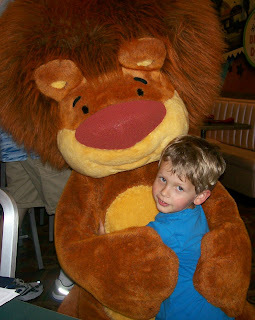 We went to 3 different restaurants that included character dining and Dawson loved interacting with the Disney characters. 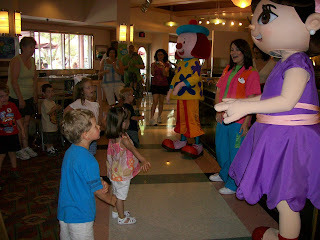 Each character stopped at our table to say hi and get a picture with Dawson and throughout the meal they would play songs and invite the kids to come up and dance with them or follow them around the room in a parade. It was great fun! The entire vacation was a blast and we look forward to going again with both Dawson and Brady. 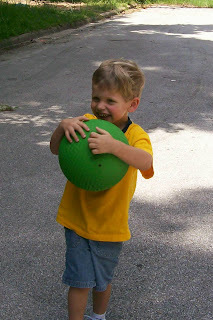 Holding on tight to his ball and running away from Dad, who is playfully trying to knock the ball out of his hands. 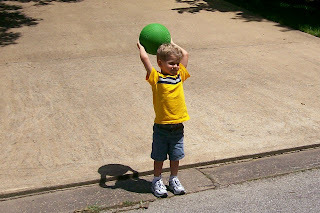 Getting ready to throw his ball. 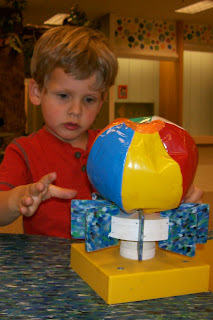 We're all playing a game of collide in which we count to three and then all throw our balls and try to make them collide with each other. 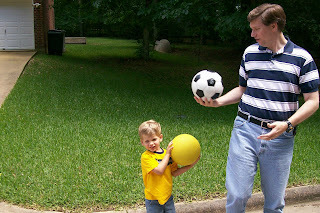 Dawson and Dad playing balls outside. 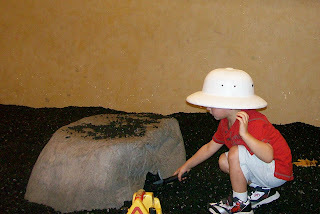 The children's museum has a really neat sand room with a giant sand box and many sand toys. 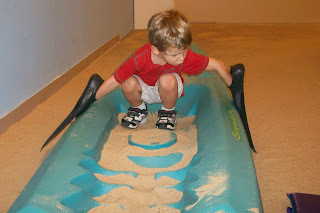 They also have this kayak, which Dawson always enjoys playing in. 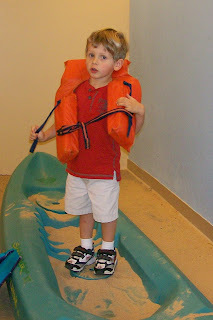 Wearing his life vest for safety. 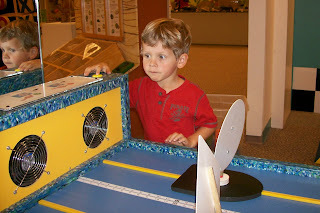 He couldn't find any oars so he improvised by using these flippers!! 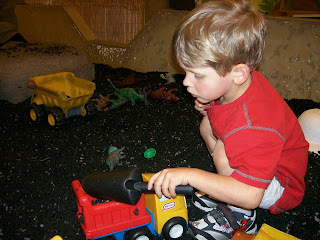 Filing up one of the dump trucks with the shredded tires that make up the dinosaur pit at the children's museum.